Why do you need a backup software when today's hard drives seem so reliable? Well even if they are so reliable it's only a matter of time until they crash. Of course, some of the new hard drives "delay" that crash giving you a false sense of data security. Until virus attacks, software or user errors, even theft threats intervene and increase the probability of losing your important data. A quick question (from someone that doesn't store valuable data) would be "So what?" It is well known and applicable almost in every domain that the cost of prevention is several times less than the actual cost of repairing or fixing a problem. However, even if all this it's widely known, billions of dollars are lost every year because of technical problems that lead to loss of data. That's why you need to be prepared and always backup your data on a safe storage. This way you can easily restore your data in case the inevitable happens. This is where the need for the best backup software becomes stringent. Older backup software programs used archive bit to keep track of backed up files and had a not so intuitive interface. Backing up data was a time-consuming task and very often the backup process needed user assistance. This is not the case anymore. Backup4all is an award-winning backup software able to make the backup task easier to bear. It is highly customizable and offers an intuitive interface. This is why Backup4all is easily accessible for beginners and a powerful tool for professionals. Standard Zip Compression and zip64 support. Zip compression will reduce the size of the resulting backup, which means less storage space occupied. This leads to reduced costs for storage, especially noticeable when backing up online. Backup4all offers the option to create standard zip files. Not only that this provides the desired compression, but also the zip format is a standard one, meaning you can access your backup with any zip utility available on the market. So say no to a backup software that compresses in a proprietary format because if you decide to not use that program anymore, you can't recover your data. Furthermore, unlike other backup software, for .zip files greater than 2 Gbytes, Backup4all uses zip64 technology, which allows unlimited zip file size. Incremental backups. Incremental backup provides a faster method of backing up data than repeatedly running full backups. During an incremental backup, only the files changed since the most recent backup are included in order to increase the speed of the backup process. Backup4all offers incremental backup along with three other backup types (full backup, mirror backup, and differential backup). Backup job scheduler. Backing up manually is a tedious work, that's why a good backup software should offer backup job schedulers, meaning that you define a backup job and set it to be executed automatically at specific time intervals. 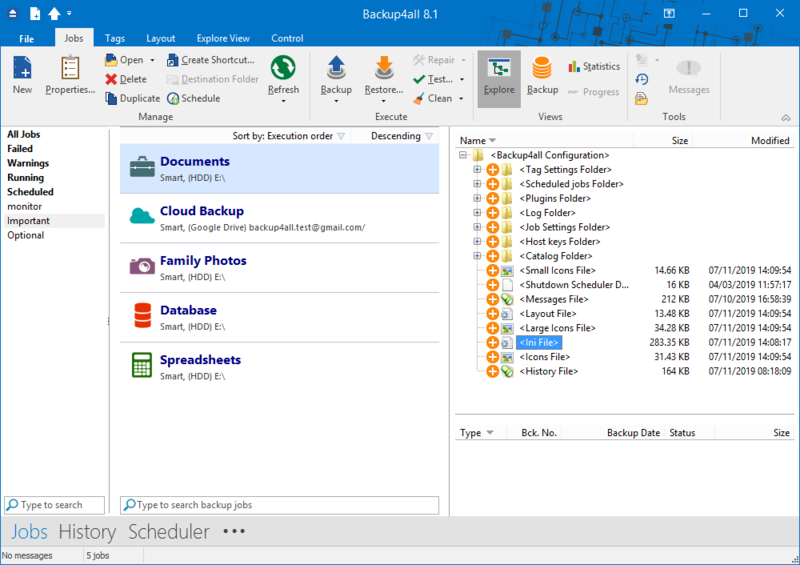 Backup4all has a scheduler so using it you can simply set it and forget about it, as it will do the backups automatically. Data Encryption. Backups contain sensitive data, so a good backup software should provide an option to encrypt the backup so that if it gets lost or stolen it would be protected. Backup4all supports 128-bit, 192-bit, and 256-bit AES encryption, offering you the option to encrypt the backup so that it will be almost impossible to crack if lost or stolen. Easy to use. A backup program should be easy to use for novice users and still offer the features advanced users need in order to customize it for their specific needs. When first started Backup4all offers a Startup page with quick access to its main functions, Backup and Restore, as well as links to useful articles or contact information. Furthermore, both the backup and the restore processes have their own wizards that guide users step-by-step. Support and documentation. If you have a question about the backup software you should be able to find an answer easily. Backup4all comes with an integrated help file, but also offers the possibility to download the extended user guide or read the online help. Additionally, we have compiled an extensive online knowledgebase and our support team is always ready to offer solutions via email. Backup destinations. When selecting from different backup software, you have to pay attention to what backup destinations are offered. Backups can be stored on the local computer (not recommended), on another computer in the same network, on a USB or flash drive, on CDs/DVDs or Blu-ray Discs, on external drives or at remote locations such as FTP/SFTP servers and cloud backup destinations (i.e. Google Drive, Microsoft OneDrive, Dropbox, Amazon S3, Azure, etc.). Backup4all offers all these destinations, so if you intend to store your backups in different locations you have where to choose from. The above features are some of the most important ones when choosing a backup software but in order to be sure you have the best backup software that fits, you will have to test it yourself. This is why always make sure a free trial is offered. Backup4all Professional offers a 30-day free trial and during this time all the features of the registered version are available. One particular advantage of Backup4all over other backup software is that it creates its own catalog to keep track of the new and modified files. This makes the backup process quicker, because our backup software knows exactly what files and folders to check for (defined using backup sources and file filters), avoiding a time consuming full drive scan. By using its own internal backup catalog instead of relying on the archive bit, it also avoids any conflicts with other backup programs or archiving utilities. Backup4all's enterprise licensing system provides a solution for large computer environments with a special focus on the network environment. Backup4all is designed to be reliable, easy-to-use and affordable. It can be used as a reliable backup solution in networks with hundreds of computers connected.